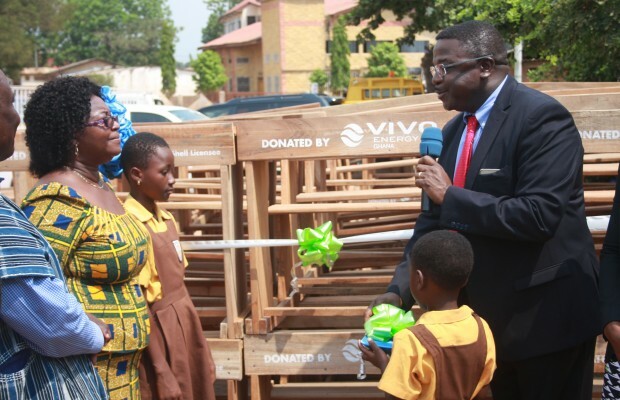 Vivo Energy Ghana Limited, the company that distributes and markets Shell-branded fuel and lubricants, has donated 50 dual desks to the Kwashieman ‘2’ Primary School in Accra as part of its corporate social responsibility. Speaking during the presentation on Wednesday, Ebenezer Faulkner, Managing Director of Vivo Energy Ghana, said the donation was to help facilitate teaching and learning at the school. According to him, the donation was in response to an urgent request from the school’s authorities for assistance. He said the presentation of the donation showed his outfit’s commitment to promoting education in Ghana. “We operate in local communities across Ghana and feel that it is the right thing to give back to society too. Our efforts to continuously support our communities is in line with our commitment to education and belief we have in our children to become great future leaders,” Faulkner said. He added that Vivo Energy would continue to contribute its quota to the development of communities in the area of road safety, education and environment. Mr. Faulkner presented the desks to Angela Tena Mensah, Metropolitan Director of Education in Accra, who also handed them over to Dorothea Agbettor, Headmistress for the school. Justice Joe Appiah, Member of Parliament (MP) for Ablekuma North, indicated that Vivo Energy must be commended for playing its role responsibly. Mr Appiah urged other corporate entities to emulate the gesture. Dorothea Agbettor commended Vivo Energy Ghana for coming to their aid and urged them to continue their good works in the country.